As we near the end of 2017, we are looking back on a cause that was near and dear to our hearts this year. 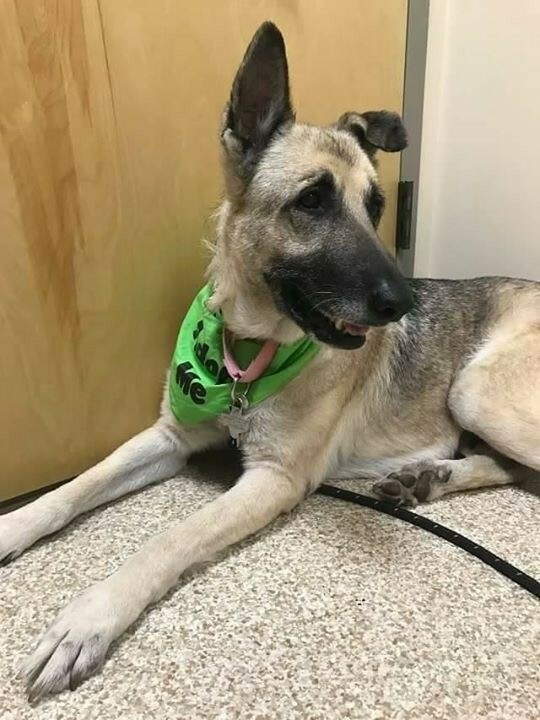 In partnership with Zoetis, Leesburg Veterinary Hospital’s Dr. Jennifer Boyle helped dogs from local rescue organizations FOHA and Shenandoah Shepherd Rescue overcome heartworm disease. Heartworm disease is a very serious and potentially fatal condition caused by parasitic worms that live in the pulmonary vessels – the vessels which carry blood from the heart to the lungs. Heartworm disease causes severe lung disease, heart failure, and damage to other organs in the body. Dogs and cats of any age, breed, or living condition (indoors or outdoors) are at risk in our area. Heartworm disease is transmitted by mosquitos. 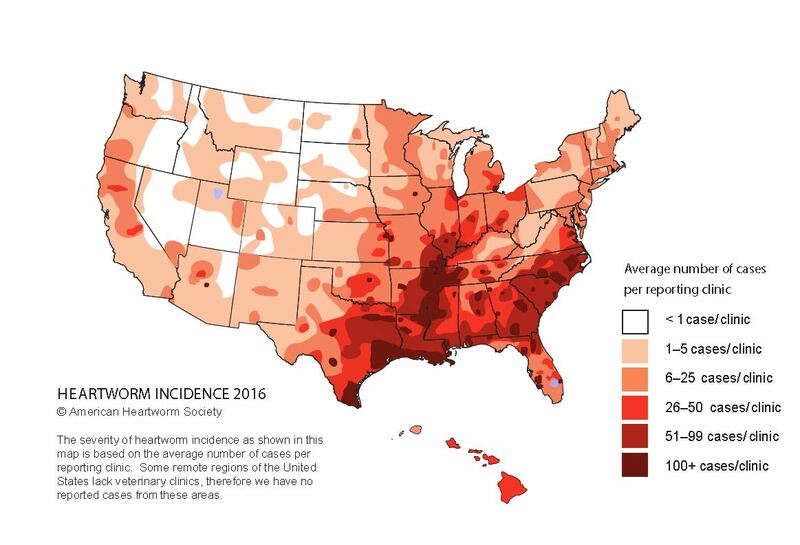 Looking at the map below, you can see that our area ranks in the mid-to-high levels of heartworm incidence compared to the rest of the country. Dr. Boyle and the LVH team provided treatment to four dogs in 2017- Sachi, Mae, Goliath, and Joni. 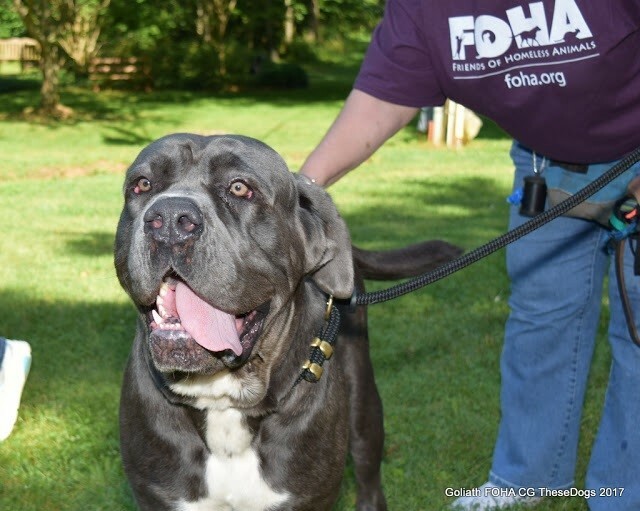 Their treatment consisted of veterinary exams, laboratory tests to confirm the heartworm disease, baseline bloodwork values, medications, heartworm treatment injections, and hospitalization during the procedures. With the help of Zoetis, LVH was able to provide these services at no cost to the rescues – making the dogs more adoptable and allowing the rescues to help more pets! 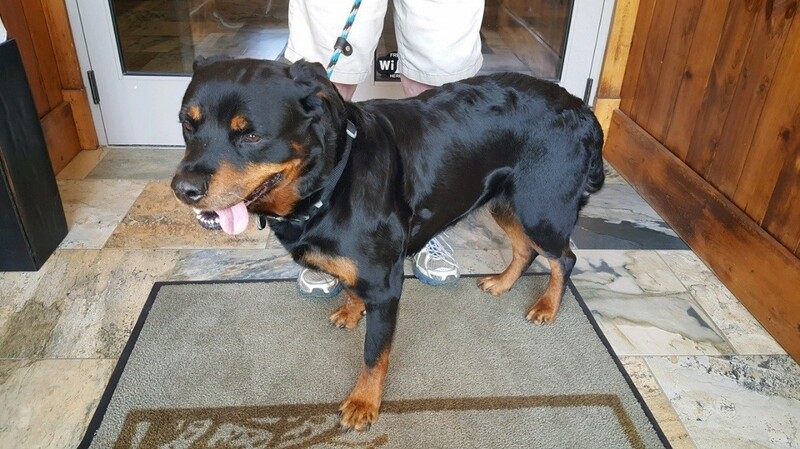 This is Sachi, a 2-year old spayed female Rottweiler who couldn’t be any sweeter! 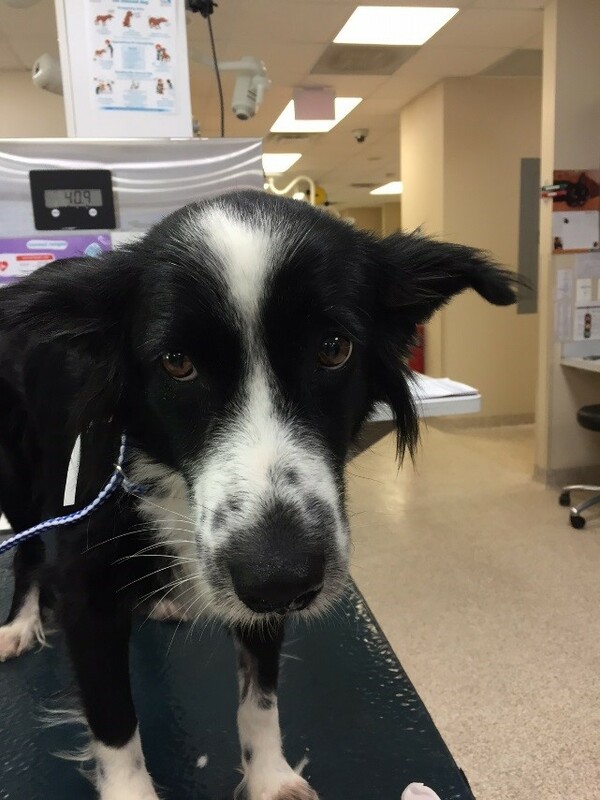 Mae, a 2-year-old spayed female Border Collie Mix had several health issues when she first came to see us, but is doing much better now! 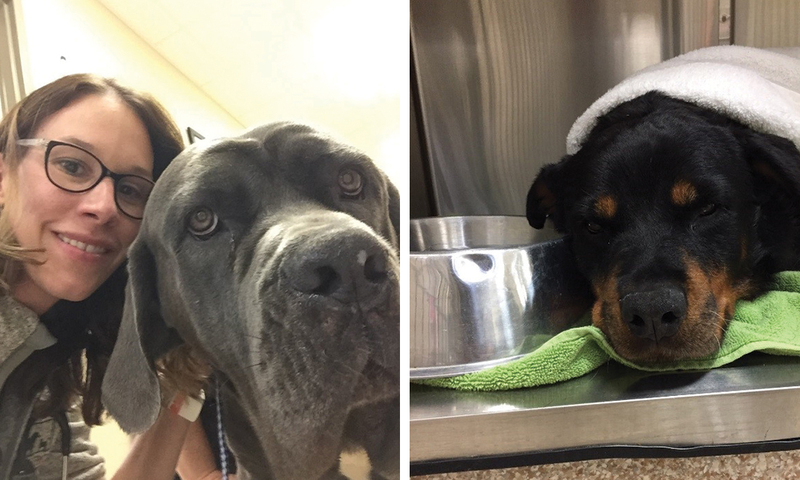 Goliath is a 1-year old gentle giant that we loved having visit our hospital! Here is Joni, a 6-year old spayed female German Shepherd who began heartworm treatments this past Fall. Here are Goliath and Sachi during one of their heartworm injection treatments. Dr. Boyle was able to get a quick selfie with Goliath! Being able to save these dogs from a serious and oftentimes fatal disease like heartworm has been incredibly rewarding for the entire LVH team. We hope to expand upon this service to help even more dogs in 2018. If you would like to donate to this cause, please contact us at 703-777-3313 or download and fill out our Benevolent Donation Form. Even though heartworm disease is prevalent in our area, it is preventable! We recommend routine annual heartworm screening (a simple blood test) for all of our dog patients, and monthly heartworm prevention for all of our dog and cat patients (and ferrets too!). The diagnosis is much more complex in cats; currently, there is no feline treatment and medical management is very expensive and challenging. To learn more about this illness, visit our blog: The Heart of the Matter: Understanding and Preventing Heartworm Disease.